The culmination of my week long social circuit 2 weeks ago was the New York BBWAA dinner that took place at the New York Hilton on January 25th. This event annually attracts the game’s biggest stars as post season awards, including the MVP, Cy Young, and Rookie of the Year, are handed out. 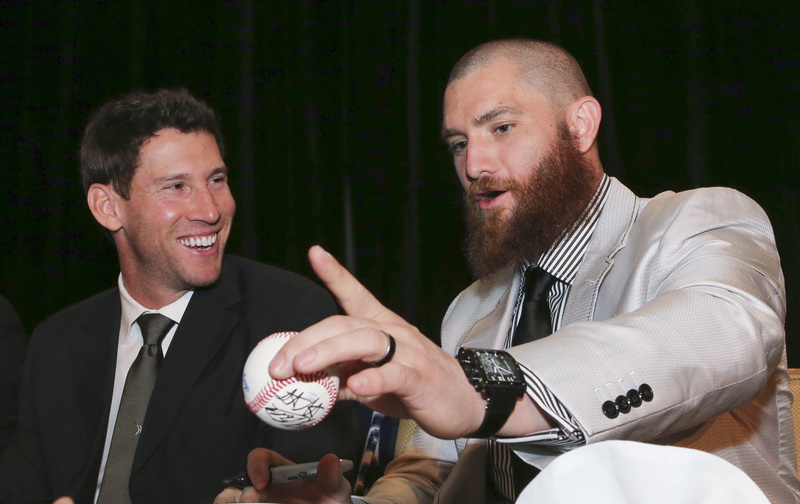 The 2014 BBWAA dinner also included some of the greatest players in history, as Hank Aaron joined Miguel Cabrera, and Sandy Koufax joined Clayton Kershaw on a star studded dais. I was invited, and accepted before the invitation could even be completed, to share a few remarks about the 2013 season and to present the “You Gotta Have Heart” Award to Boston Detective Kevin McGill who was on site during the marathon bombings. Rather than attempt to highlight such a phenomenal evening, I decided to instead post the text of the speech I gave to nearly 1,000 guests in attendance. I’m not terribly certain how it came to be that I would be standing in front of you at baseball’s most prestigious dinner alongside the most elite performers in 2013. I was narrowly outpaced by Miguel Cabrera in the MVP race, falling exactly 44 home runs and 137 RBIs short. I speak to you instead, as a representative of the World Series Champion Boston Red Sox, and as a citizen of a city devastated by unthinkable tragedy and rejuvenated by unexpected triumph. For this, I feel exceptional pride, humility, and responsibility. In preparing this evening’s remarks, I navigated through a mental rolodex of public speaking dogmas: I thought of humor, charisma, and cadence, but when I stripped down the trivialities, I was left with a single, overarching theme. Tonight, I strive to accurately, candidly, and appropriately portray exactly what it was to be a member of the Boston Red Sox through the 2013 season. A common inquiry into any successful exploit goes something like “when did you realize you had the chance to do something special, or more specifically, when did you think this team had a chance to win the World Series.” It is no secret, prognosticators, several hundred of whom may be sitting in front of me, handicapped the odds of the Red Sox becoming World Champions as “unfavorable” Fortunately, no current member of the Red Sox have active BBWAA membership cards. The truth is, even independent of the benefit of hindsight, this group had a unique confidence that was palpable on the first day of spring training. Ben Cherington and John Farrell were far more ambiguous about the prospects of the 2013 team, but players talked about winning the World Series in line for physicals before our first team workout. I can say unequivocally, that I have never played on a team that prioritized winning above any individual accomplishment or personal achievement moreso than this team. The clubhouse was less a place to store uniforms and equipment, than a classroom for baseball education. Winning the World Series was as much a product of chemistry, selflessness, and will as talent, execution, and management. Those things, and of course, David Ortiz. Reflection on 2013 invariably takes us to April 15th, as on that day the city of Boston was changed forever by the profound evil of two self-radicalized individuals. Much like other epic moments in history, many of us remember our exact whereabouts when we heard of the marathon bombings. I was recovering from a shoulder injury at our spring training facility in Florida, and wanted to check in with a friend who had run the marathon. Amidst a benign text conversation, he sent a message that read “something just happened, something really bad, like a bomb.” Minutes later, news spread of two explosions near the marathon finish line. Photos of that horrific scene will forever be etched in our memories. Inconceivable tragedy was mitigated only by the selflessness and bravery of first responders and bystanders. In the days that followed, law enforcement executed an unprecedented lock down and manhunt, culminating in the identification and capture of both perpetrators. In the weeks that followed, the residents of Boston, seeking answers and seeking solace turned to each other, turned to law enforcement, turned to their leaders, and turned to the Boston Red Sox. 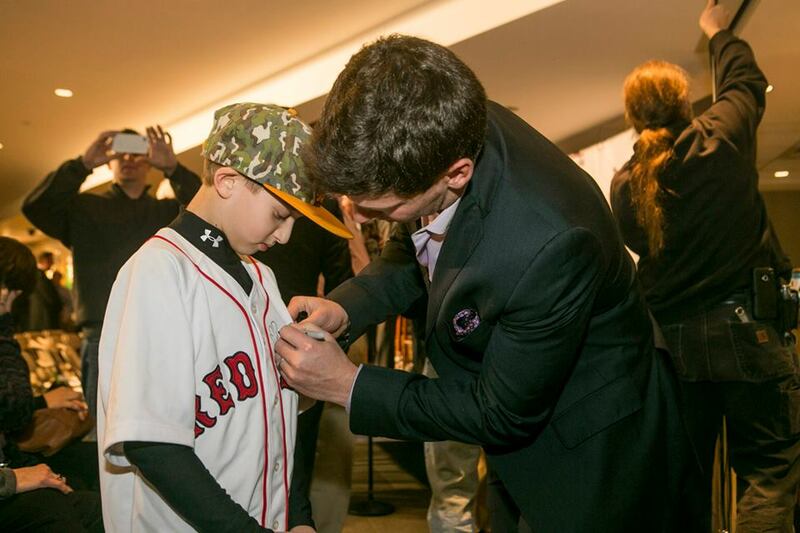 The phrase Boston Strong became ubiquitous, contagious, visible over social media, on tee shirts, bumper stickers, and most notably on the Red Sox jersey hung in the dug out every game that followed the marathon bombings. On April 20, baseball returned to Fenway Park. A montage aired on the jumbo-tron in a moving tribute before the game. First responders were welcomed onto the field alongside injured survivors. And in a moment we will never forget, David Ortiz delivered a certain warning about exactly whose city this is. In a game that could not have been scripted better by a screenwriter, Daniel Nava hit a dramatic come-from-behind home run in the bottom of the 8th inning, and we won the game 4-3. Winning was certainly fitting for such a significant day. But the truth is, we also could have lost. The importance of that day was that we played. That 36,000 fans in the stadium, and millions more at home watched a team shoulder the burden of helping a city recover by doing what they had always done, by simply playing a game. We understood our role in helping our city move forward. We visited hospitals and hosted victims. We donated money and time. And we lent our celebrity to causes. But most importantly, we never lost sight of reality. The reality that no home run, not even a post season grand slam, will allow an amputee to walk again, and no victory, not even a world series championship, could fill the void left by losing a son or a daughter, a brother or a sister, a mother or a father. And finally, we learned about courage. We learned about people willing to run toward an explosion, while thousands of others ran away. We discovered the meaning of heroism, and we learned just how strong we are. Tonight, in Kevin McGill, we honor a Boston Detective who lived under the umbrella of anonymity until that fateful April Day. We recognize a man who put others before self and who sprung to action during our city’s most dire moment. Tonight, we acknowledge a true hero. The You Gotta Have Heart Award recipient, Kevin McGill. Never one to slow down, Thursday night January 23rd was reserved for Boston BBWAA awards dinner. 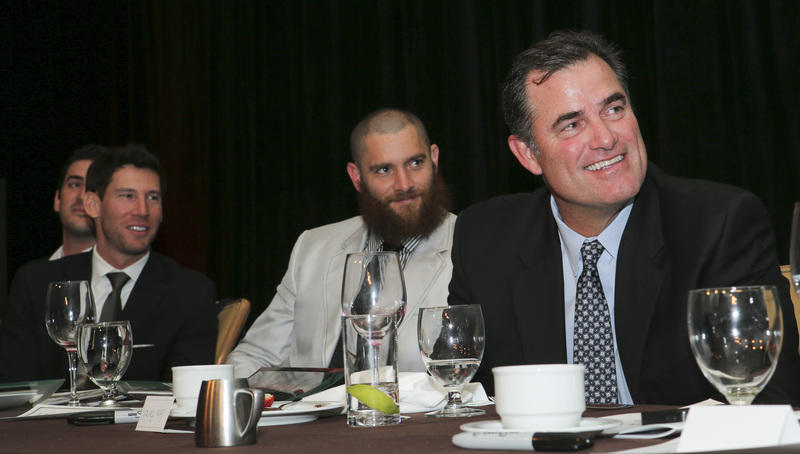 I joined Jonny Gomes, Jon Lester, John Farrell, Ben Cherington, Matt Harvey, and many others on the dais for a final look back at the 2013 season. I was incredibly humbled to accept both the Unsung Hero Award, and the Tim Wakefield Award for community service. As a player who has spent most of his career mired in anonymity, it was great to be recognized for my contributions to the team, both on and off the field. In accepting my award, I noted that “we had a cast of 25 unsung heroes” and I believe that to be unequivocally true. One thing I did ask the audience, rhetorically, is if the nature of the “unsung hero” award precludes a player from being a multiple winner. Despite not being heralded entering the 2013 season, this team. Of course realized the ultimate. The success of this team was rooted in having 25 guys capable of a game winning performance on any given night. 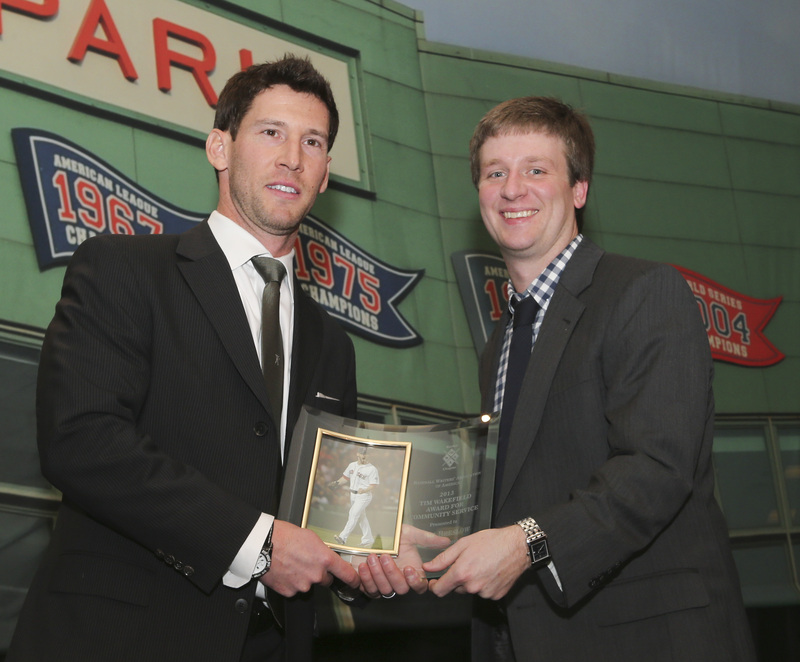 Without question, the highlight of the evening was the inspiring remarks by former Red Sox prospect Ryan Westmoreland. Westmoreland spoke of a promising baseball career derailed by the detection of a cavernous malformation at his brainstorm and his subsequent brain surgeries, with neither bitterness nor disdain. He admirably accepted his fate, and urged current players to never take a moment for granted, because there was nothing he wouldn’t sacrifice to be able to put on a uniform and play once again. As often as we hear stale expressions about enjoying every moment of life’s roller coaster, Ryan’s message was highlighted by candor and sincerity. 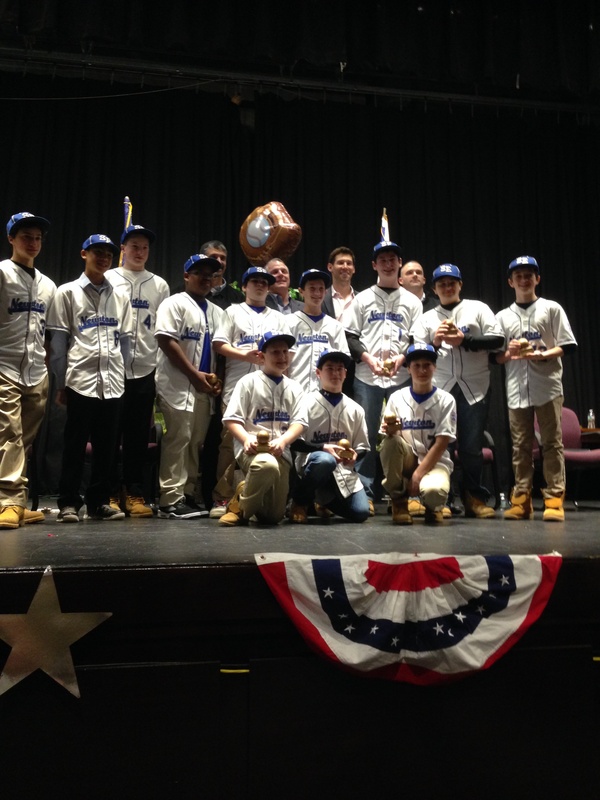 Last Wednesday’s social calendar brought me to Temple Mishkan Tefila in Chestnut Hill where I was honored, alongside the Massachusetts Champion Newton South East Little League. After an intimate reception with some of the event sponsor’s, and a lot of hand shakes and smiles, dinner and a program took place in the temple’s beautiful sanctuary. I gladly assisted in handing out trophies to the Little Leaguers, and finally interacted with a team on which I would not have been the smallest player. I would not have been the tallest either, but middle of the road is all I strive for these days. Guests were treated to ball park treats – hot dogs, burgers, popcorn, and soft drinks as they per used a silent auction. After an incredibly complimentary introduction and brief video detailing my Strike 3 Foundation, I accepted the temple’s Distinguished Service Award. 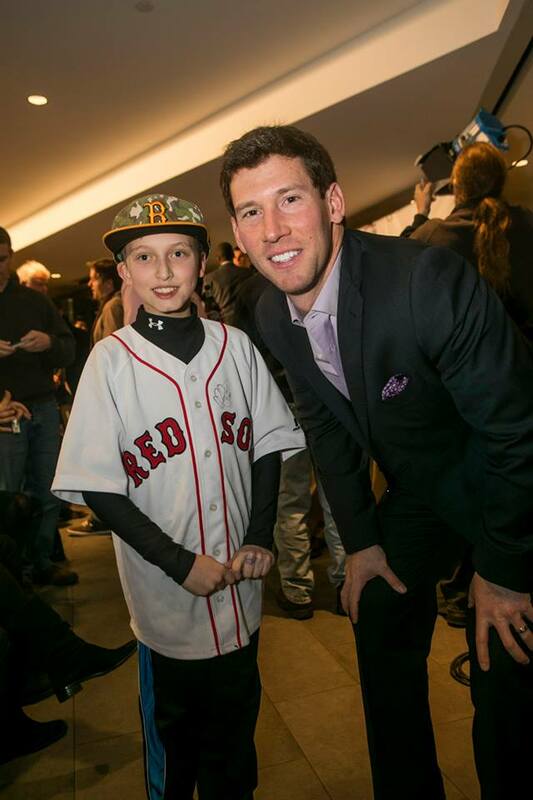 I used my time as an opportunity to recount a couple of stories about my big league career, my experiences with the 2013 World Champion Red Sox, and the work of my Strike 3 Foundation. I closed by urging the audience, young and old, to find a cause about which they feel passionate and donate some asset to it; time, service, expertise, or money. Finally, I graciously accepted a number of gifts including an honorary membership to the temple, a beautiful mezuzah, a uniform and open invitation to the synagogue’s softball team, and an incredibly generous donation to Strike 3 for $10,000. 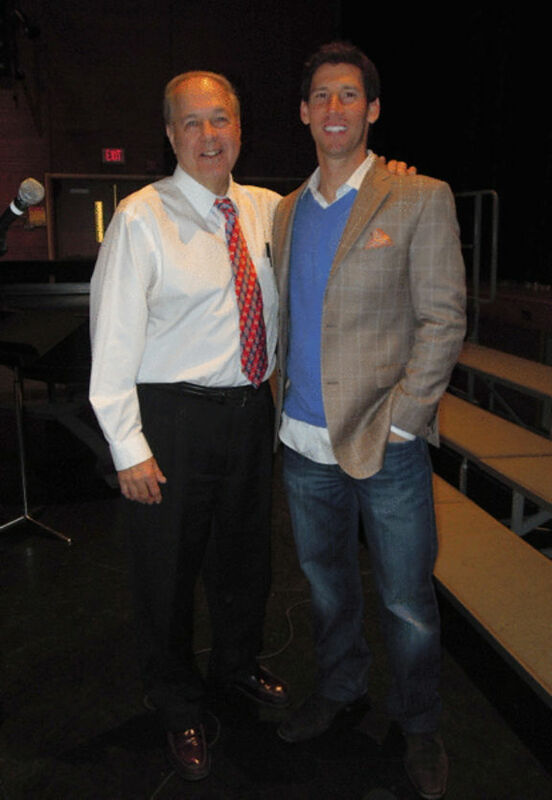 Many thanks to Chuck Diamond and all of the people who helped ensure the success of the evening. 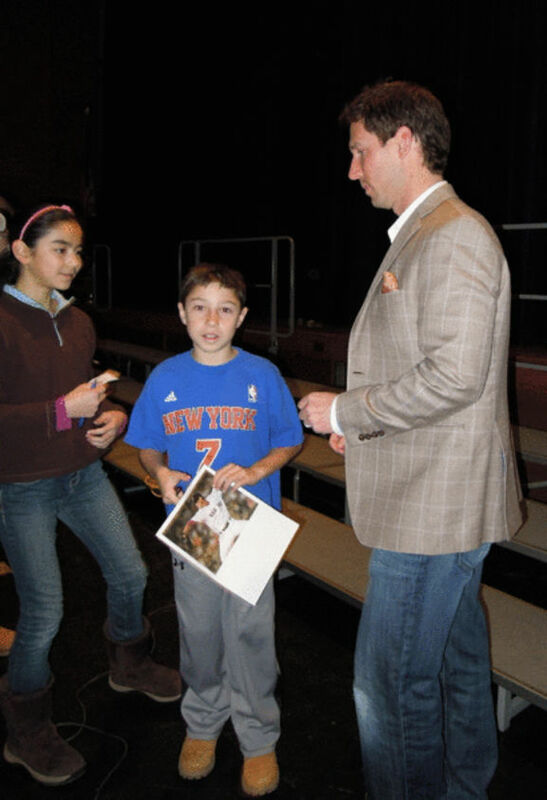 On January 9th I had the opportunity to speak to the students at Eastern Middle School in Greenwich, CT. For the second consecutive year, these generous students and teachers have generously supporting my Strike 3 Foundation with a novel and unique approach to fundraising. Last year, in exchange for a small donation, students were able wear a hat of their favorite sports team. It is worth noting that given the proximity of Greenwich to New York, it is likely that most students chose that team from New York over their more beloved Boston rival. 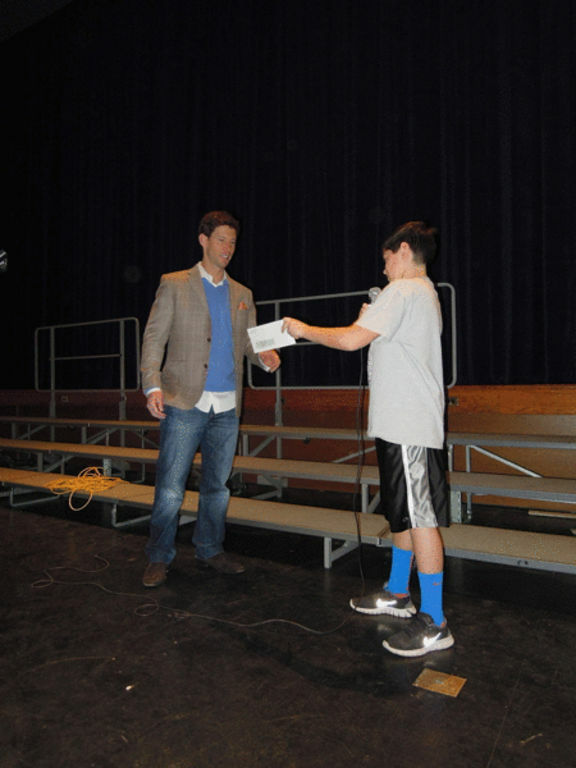 Anyhow, this year the donation was made in exchange for the opportunity to participate in a Halloween Dress Up Day. The students listened intently to anecdotes about our championship run, lessons about overcoming adversity and doubt, and a few lighter moments shared by an oft-released, undersized reliever. 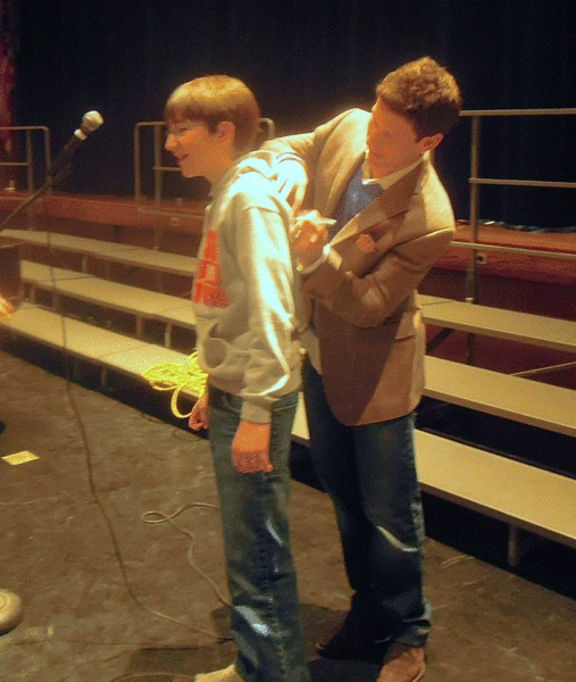 The students, however, were most receptive when I began to speak about Strike 3’s Play It Forward Initiative. I recounted a few examples of idea submissions the organization has collected and could see the students’ creative wheels spinning as they considered ideas of their own. An interesting note came from a casual conversation with Eastern principal Jim Shuckie, to whom I owe much thanks for organizing Thursday’s assembly. Mr. Shuckie noted that while in 2012 there was a “price” to participate in Hat Day, the 2013 Halloween Dress Up Day was run with a simple “donate what you wish” requirement. Perhaps we should be surprised that the 2013 donation was nearly 80% greater than 2012. Then again, based on the initial returns of an initiative that gives young students a voice, a cause, and some freedom, perhaps we shouldn’t be surprised at all. The busy week that I had forecasted a couple of entries ago got the best of me, and now, I shall do my best to catch up. 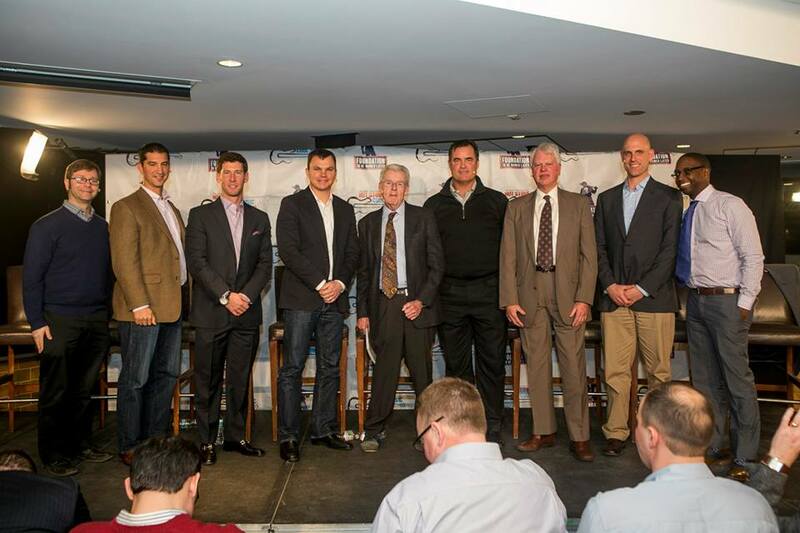 On Tuesday of last week, I participated in a baseball round table discussion at Fenway Park to benefit the Foundation to be Named Later and Peter Gammons Scholars. Not even nearly a foot of snow and Arctic temperatures could keep hundreds from gathering to listen to Ben Cherington, John Farrell, Mike Hazen, and others discuss the culture of winning. Gammons served as moderator. Despite being a participant in the discussion, it was nonetheless insightful to also act as a listener as Ben and John discussed the impetus behind a number of off season transactions, and outlined the development and construction of the 2013 roster. Both spoke candidly about the need for a paradigm shift in the climate of the Sox. Other lighter topics included the birth of the beard, to which John quipped that Mike Napoli’s unkempt growth may require a weeds hacker to be tamed, and Dustin Pedroia’s, umm, diminutive stature. All in all, the event provided an intimate glimpse into the cultivation of a winning team, and most importantly, served to raise important funds for inner city students to attend college. On the nearly 4 hour trip from New York City to Boston, I had ample time to reflect on the life of a brilliant man who was taken from us far too prematurely. Michael Weiner was the Executive Director of the MLBPA, and he was also a friend. On Monday night, we said our final goodbyes in a celebration of his life. In a tribute filled with his favorite music, and attended by his family, friends, and colleagues, we heard from a number of those blessed by his companionship. We listened to remarks from his Rabbi, his predecessor at the PA Donald Fehr, former players, current players, and his wife Diane. In perhaps the most touching moment, his daughter Grace performed on stage one of Michael’s favorite songs. While each speaker offered unique and insightful anecdotes, few spoke of his unmatched intellect and obvious brilliance, the overarching theme, was that Michael, in some special way, made all of us better. I’d like to share the moment I realized just how pure and sincere and decent Michael was. It was 2009, about 2 months after Michael had taken over as executive director, and I was hosting a small networking event for my Strike 3 Foundation in New York City. While Michael had handled the transition into his new role with aplomb, I was certain that the first few months as ED would be tiresome, long, and difficult. Nonetheless, I wanted to invite Michael to the event, sure that he would decline, so that he knew I had thought of him. Sure enough, at around 7 pm, Michael strolled into the small neighborhood bar, wearing his vintage blue jeans and Chuck Taylors, after leaving the office and preparing to head home to see his family. I said hello, and told him that I was surprised he had made it as I hadn’t seen him at many other events, if any, and was positive his work demands had left him exhausted. His response, which I will never forget, was so simple and innocent, he said “Of course I would come, I would come to all of these things, I just never get invited.” That was Michael. Understated and reliable. 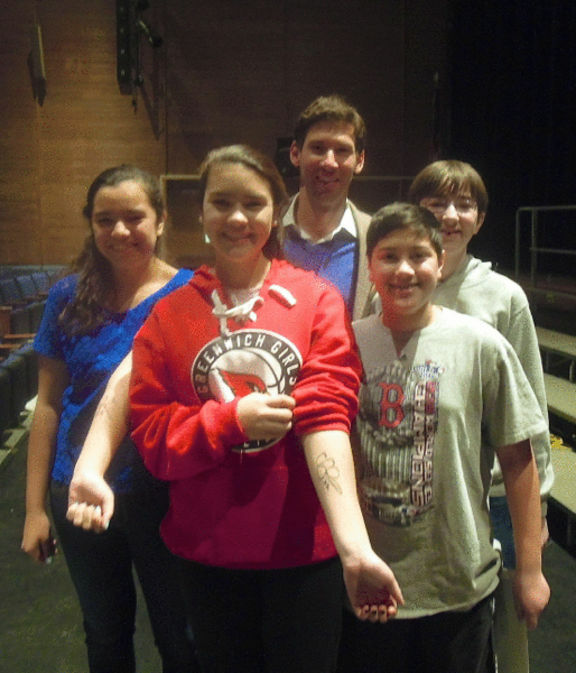 Michael’s strength through his battle with brain cancer was remarkable. His courage and bravery served to inspire us all. He stated that each day he sought to find joy, meaning, and beauty. I believe the single most important thing we can do to remember Michael’s legacy, is to seek those three thing as well. The upcoming week makes for perfect blogging fodder, considering I set out to elucidate the philanthropic and off field endeavors of many professional athletes. My schedule reads something like this: Monday evening – Memorial celebration for Michael Weiner, former executive director of the MLBPA, brilliant man, devoted husband and father, and genuine and sincere friend, Tuesday evening – roundtable discussion with John Farrell, Ben Cherington, Mike Hazen, Ben Crockett, and Bob Ryan, moderated by Peter Gammons, and benefitting the Foundation to be Named Later, Wednesday evening I will be receiving a Distinguished Service Award from Temple Mishkan Tefila, with proceeds from the celebratory dinner benefitting my Strike 3 Foundation, Thursday evening I will humbly accept a pair of awards at the BBWAA – Boston Chapter dinner. I’ll use Friday to catch my breath, before heading to New York for Saturday’s BBWAA – New York Chapter Awards Dinner. I have the distinct honor of representing the Red Sox at this prestigious event. 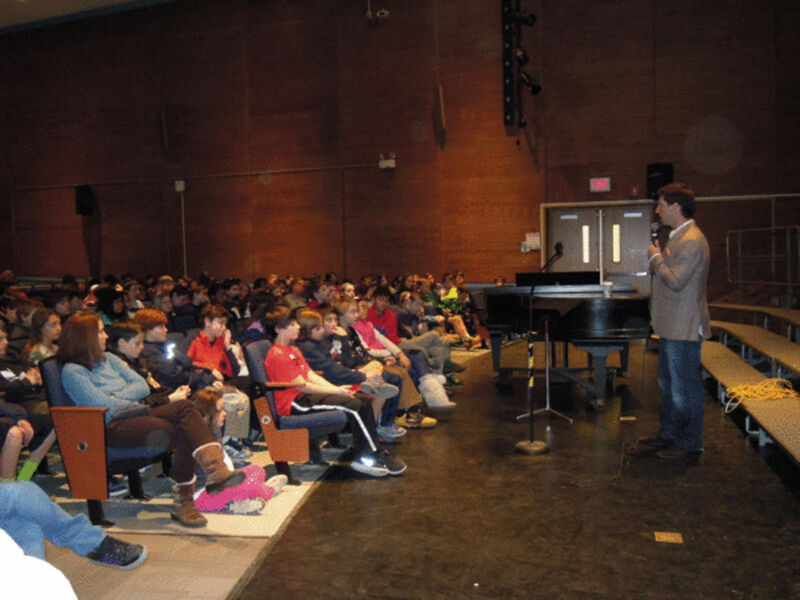 I will head back to Massachusetts on Sunday to speak to the student athletes of Amherst’s LEADS program. Finally, on Monday, I will travel to my alma mater to speak with members of the Yale Law School. Whew. I share this information for neither sympathy nor praise but simply to illustrate that a) our off seasons are pretty busy and b) we understand the importance of being visible and responsible figures in our communities. This snapshot is a bit misrepresentative of an entire off-season, but for my teammates, the willingness to participate in local events and to support local causes is not. I look forward to recapping the week, event by event. 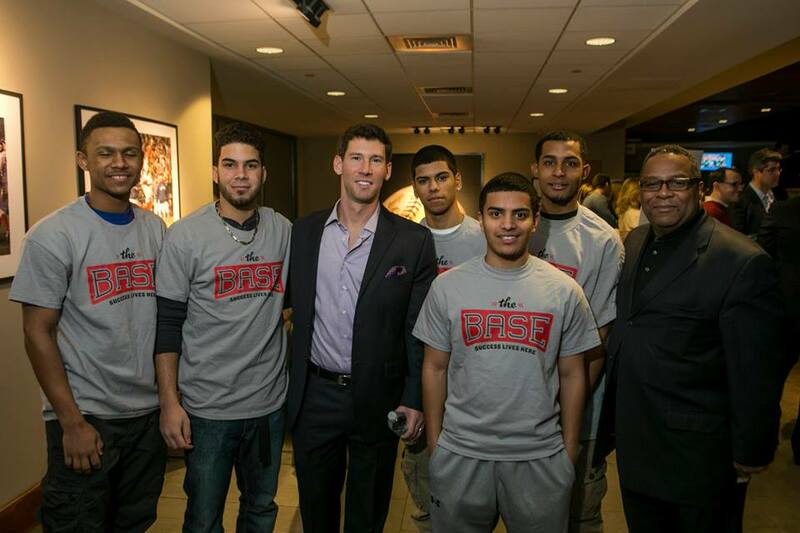 Roberto Clemente Award Vote I’m the Red Sox finalist for the 2013 Roberto Clemente Award.